rear view: pickups: a valley love story, at spitzer art center. | i love my burg. rear view: pickups: a valley love story, at spitzer art center. When I arrived at Spitzer Art Center last Friday, I parked near an interesting-looking pickup truck. 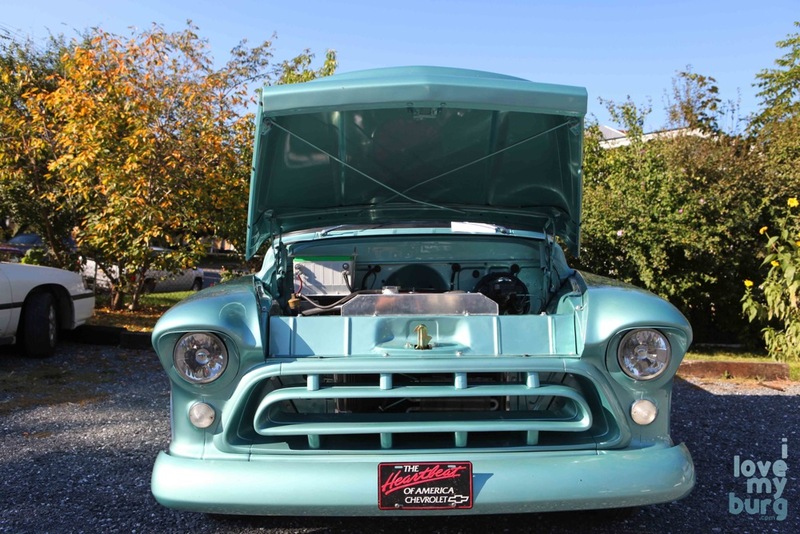 An old, classic Chevy — teal, or maybe sea foam green. Its hood was open, and when I peered underneath, I saw a bottle of Crown Royal somehow rigged to the engine. I thought, “This is gonna be a fun art exhibit.” Yes, you’d expect an art exhibit on First Friday at Spitzer Art Center, but this one sorta changed my expectation of art itself. This was art about art. It was, like, meta art or something. A new level. 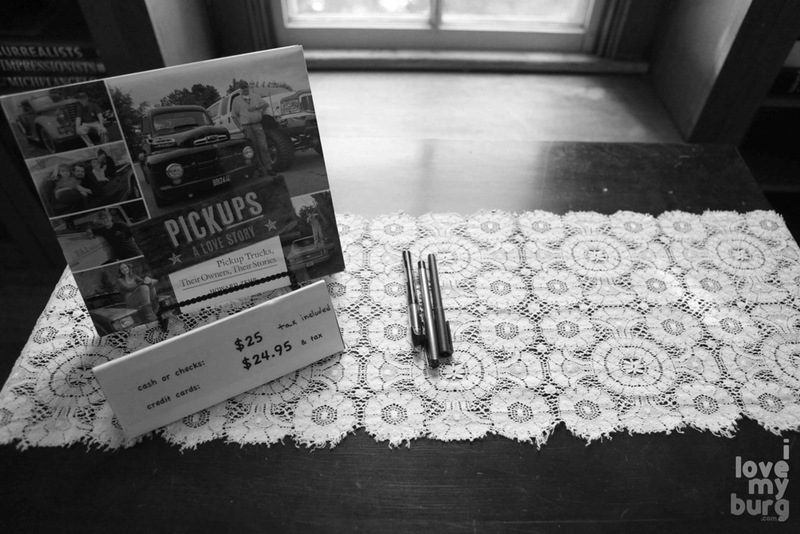 On this Friday, you could view photographs from Howard Zehr’s new book Pickups: A Valley Love Story. 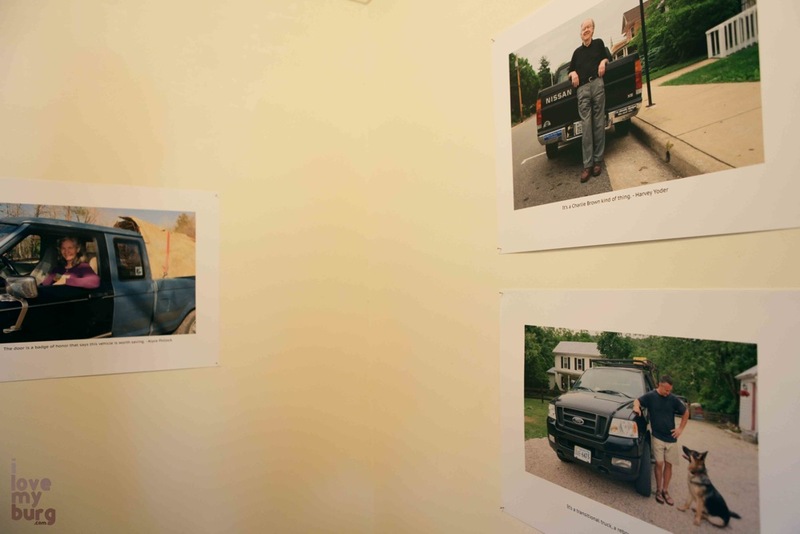 The photos show pickup trucks with their proud owners. And not only are Mr. Zehr’s photographs beautiful, but the trucks themselves stand as gorgeous, gleaming sculptures of time and memory and grit and spirit. Mr. Zehr spent numberless hours interviewing truck owners, hearing their stories… of how they came to own their trucks, of harrowing and hilarious experiences with their trucks… of why their trucks mean so much to them, then published it all in his book. And so that sunny evening, the walls of Spitzer shone with images of much-loved trucks and the words of their adoring owners. Some owners, like Lois Brown, appreciate practicality in a vehicle: “It’s not what I call pretty, but it sure is comfortable,” she says of her brown and beige Ford. Actually, I saw several of those two-tone trucks that night. I probably never noticed before, but they are pretty. I saw photos of trucks for hunting and hauling and just rolling over stuff. Even for selling coffee, like Tom Hayman of Grains of Sense. Some owners use their trucks as other vehicles, like Josh Bacon: “The kids like to pretend it’s a boat and fish off the back.” A practical solution for imaginative youngsters. And Corey Oomps — he loves his truck because “I like horsepower.” Fair enough. 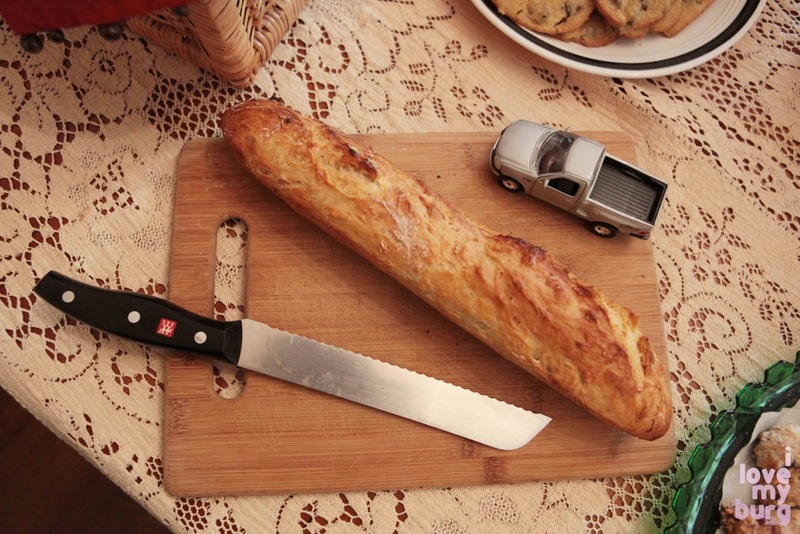 Yes, trucks have lots of practical uses, but some owners even feel like their trucks make them better people. Like Matthew “Goosey” Dolemar, who says, “Without the truck, I’d probably just be mean!” And Shannon Pollock has realized that “each thing that’s wrong with it means it’s something else I get to learn.” A kinder, smarter nation… one truck at a time. However, the most touching element that seemed to pervade the entire exhibit was devotion. Everyone’s got that one true truck love. According to Eric Beck, any new truck is just a “rebound” truck — acquired to ease the pain of losing a former truck love. You can literally see the commitment people have for their trucks, some with mismatched parts… evidence of owners desperate to repair and preserve their trucks, whatever it takes. No matter what kind of patchwork quilt it ends up looking like, that truck you fell in love with is still in there, dang it. 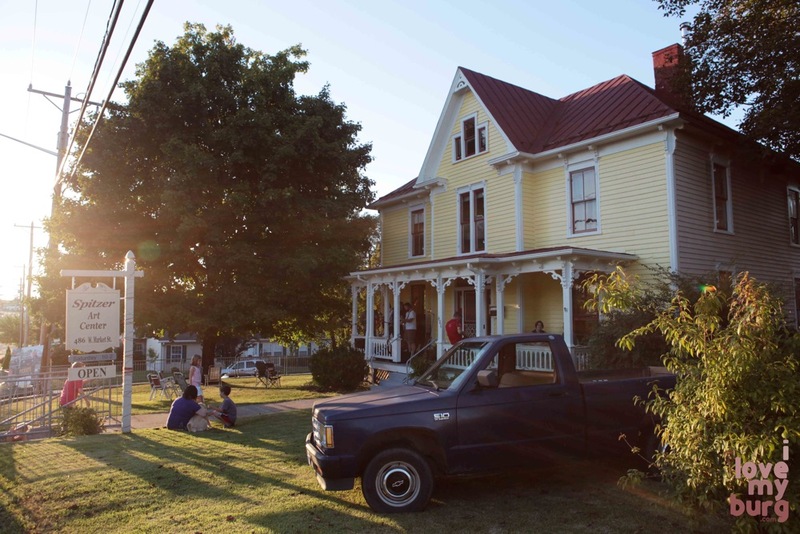 Nancy Slye possibly relocated here from New York just to use her truck more: “Running around in a pickup in New York — that was not a cool thing to do.” You know it’s serious when you actually move to another state for the one you love. 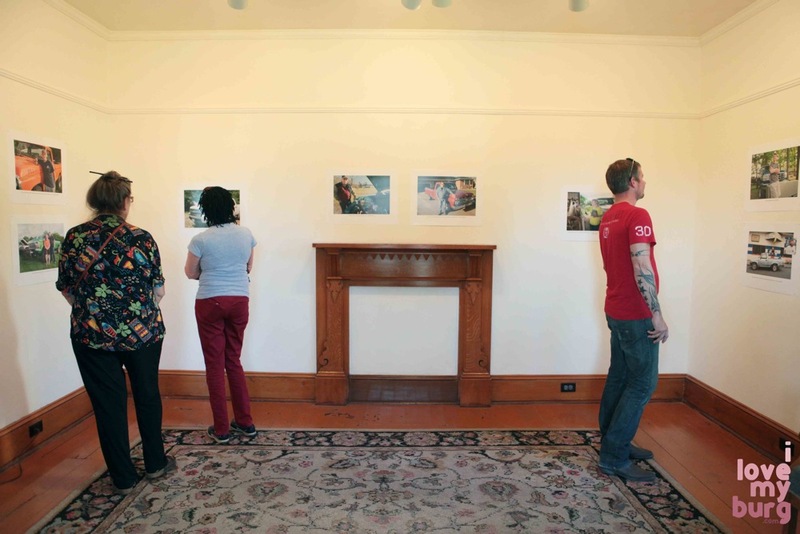 You can see the exhibit all month at Spitzer Art Center on 33 West just a block or two from downtown. Of course, you don’t get to see all of Mr. Zehr’s photos or read any of his stories (including the one about that Crown Royal truck!) unless you get the book itself. 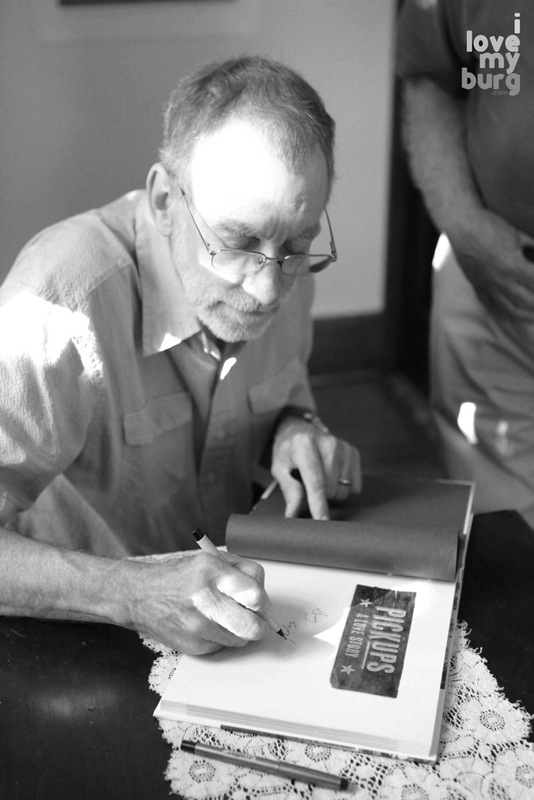 You can find it at Barnes and Noble, or from the publisher, or you can get a signed copy through his web site. 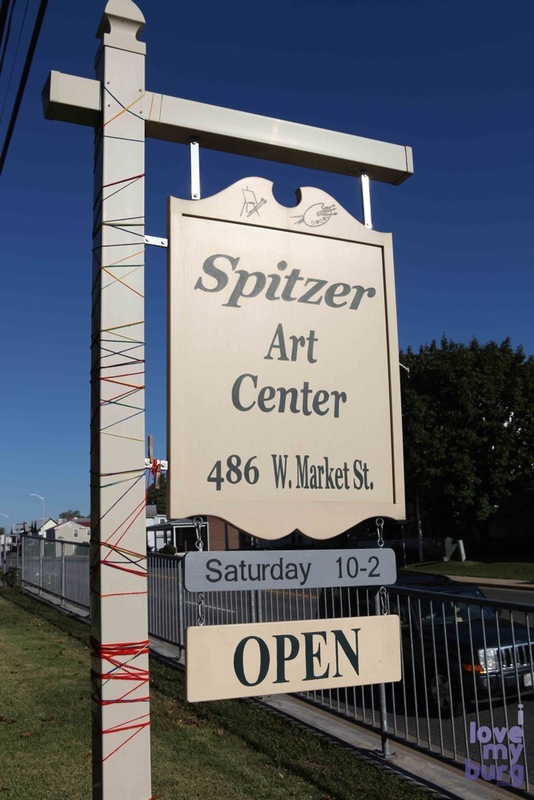 In our next post, we’ll tell you, and show you, a little more about Spitzer Art Center and our visit there. And, of course, several more megabytes of photos. Stay tuned! 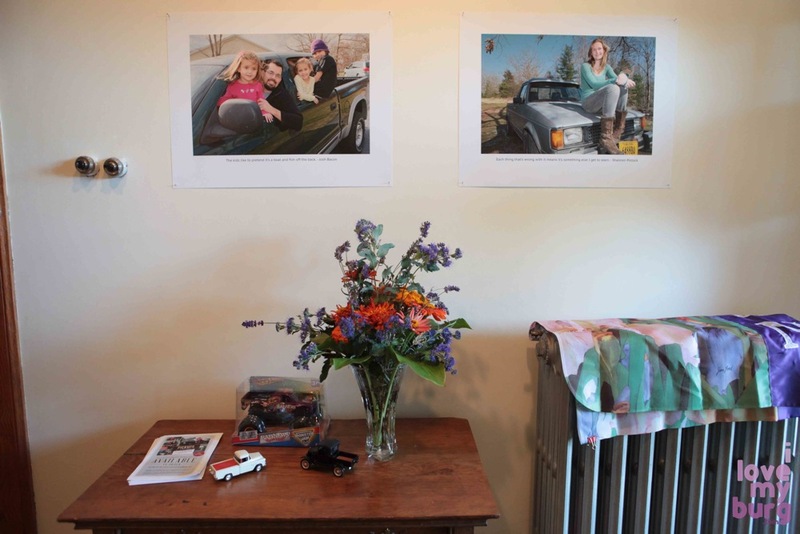 This entry was posted in events, retail and tagged art, book launch, books, Brandy Somers, coffee, Howard Zehr, Katie Mitchell, Photoshop, Spitzer Art Center by junebug. Bookmark the permalink. Pingback: light up: spitzer art center. | i love my burg.